At the weekend, there was a very special celebration lunch. It was in honour of one of my friends, who was awarded an OBE, and we were round at her house to enjoy good food and great company. We also got to see the official video of the big day at Buckingham Palace. It was so funny to watch – incredibly grand and exciting, and nice to be able to share in the event. This is my contribution to the lunch – a tray of pistachio baklava with an aromatic honey syrup. This is based on my normal nut baklava recipe, but I wanted to make it a little more special. So I made the filling with mostly pistachios, and made the sticky syrup with a good measure of honey. Rather than just using pure honey (which could be somewhat overpowering) I replaced some of the sugar in the syrup with wildflower honey, and it came out just right in terms of the honeyness-to-nutiness ration. Now, for a fancy event it needed to look fancy too. So I jazzed it up by presenting on my lovely metal Arabian-style plate (a bargain at the St Gilles flea market in Brussels this summer) and scattered the baklava with sliced pistachios and some dried pomegranate. Yes, dried pomegranate. This was news to me! Not something I had ever come across before, but the hostess was using them in another part of the meal, and I thought a few of the sweet-tart seeds would make a nice complement to the sweetness of the honey syrup. We went hunting for the famed dried pomegranate up and down Stoke Newington High Street, but to no avail. Exhausted from all that pavement pounding, we sound some refreshment at the lovely new coffee house Fred & Fran and got chatting to one of the baristas. We mentioned the dried pomegranate, and he shouted down to the chef – had she heard of it? Nope, news to her too. So we shuffled off, bought a fresh pomegranate, removed the fleshy seeds and ended up drying them in the oven at a very low temperature. Needs must and all that! So I hope you enjoy this recipe – I can’t really say how authentic it is, but it is very simple to make and it seemed to be pretty popular served with a scoop of milk gelato. In a saucepan, heat the water, sugar, honey and lemon juice until it comes to the boil and cook for a minute. Now add the orange blossom and rose waters, boil for a few seconds, and remove from the heat. Allow to cool before using on the baklava. In a dish (I used one 21 x 28cm), brush the base with a little melted butter, then add a sheet of filo. Brush with butter, then add another sheet. Brush with butter, and continue until you have six sheets of filo in the dish. Add the filling, and spread out. Be gentle so you don’t break the pastry. Now add the rest of the pastry, in each case adding a layer, brushing with melted butter, then adding the next. Finish by brushing the sixth sheet with butter. 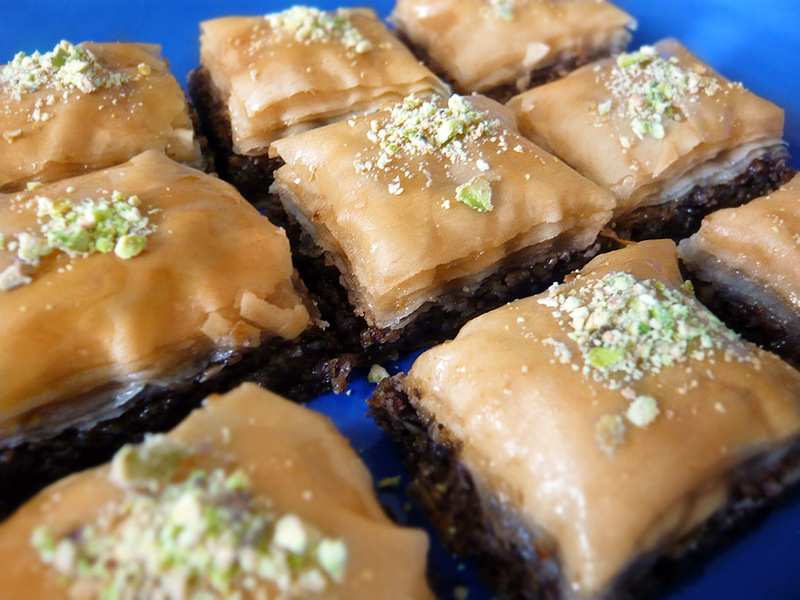 Cut the baklava into pieces – long rectangles, diamonds, squares, or whatever whimsical shapes take your fancy. Do this carefully with a sharp knife and make sure to go all the way through to the base. You might want to leave a border of “scrap” baklava where the pastry is a bit untidy at the edges. This means the final result is neater, and as the cook, you get to enjoy this “angel’s share”. Allow the baklava to cool fully before serving. Decorate with chopped pistachios and dried pomegranate seeds(**). (**) To dry pomegranate seeds – remove the red seeds from the white pith, and spread on a non-stick baking tray. Leave in the oven at 60°C (140°F) for several hours until the seeds are dry. They will remain slightly sticky but should keep their colour and not turn brown. Worth making? This version of baklava is very fragrant, and there is just enough honey to make this seem like a very decadent treat. It is also very simple to make, and can be prepared ahead of time. After Lebanese or Turkish food, I am usually too full for dessert. All those little mezze dishes are deceptive, as you just keep pick-pick-picking at them. 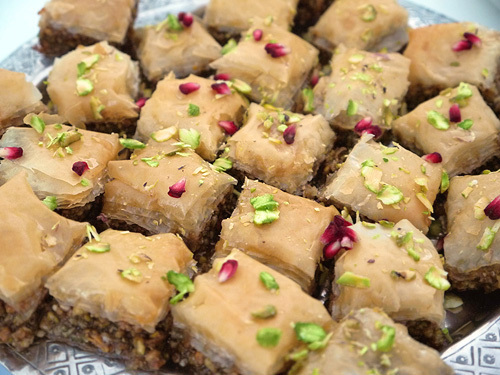 Then it’s time for a coffee, you scan the dessert menu – “just to see” – and there you see baklava, coquettishly beckoning you on with the promise of sweetness, nuts, crisp pastry and the fact that as it is so small, you can certainly manage just one little piece. I almost always end up going for it. I like baklava for those times when you want to have something sweet that does not have chocolate in it and does not have any cream. I love the golden brown, crisp, buttery pastry, and then a syrup-soaked layer of nuts and spices. If I make it at home, I am pretty free and easy with the nuts, but I do favour a mixture of almonds and pistachios with a few pine nuts. This is combined with cinnamon, and sometimes a little vanilla, cardamom or a pinch of cloves, then rounded off with a rose water and orange blossom sugar syrup. I’m going to be a bit big-headed here and declare that my version is pretty good, as guests usually refuse to believe that I made it. Then, last weekend, I was leafing through the Observer Food Monthly supplement, and I saw something that intrigued me. 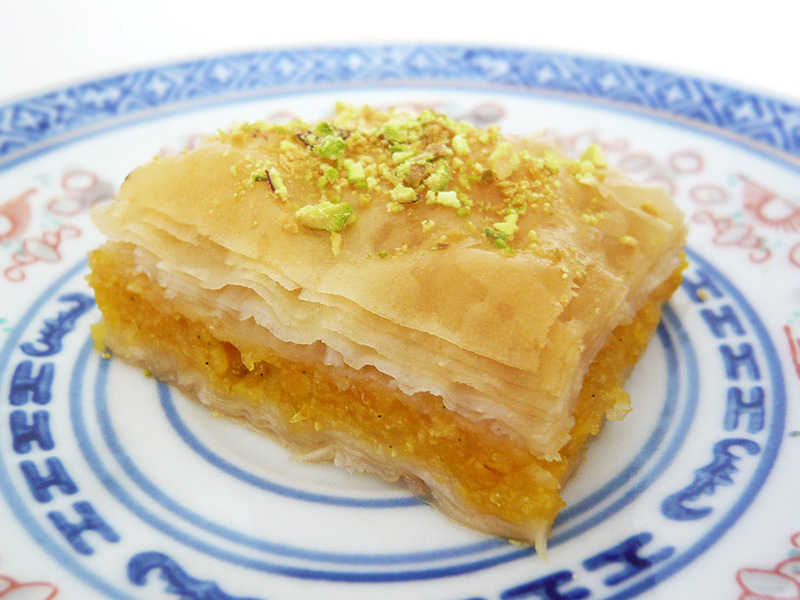 This was “Istanbul Orange and Vanilla Baklava”, referred to as the “Queen of Baklavas”. This version substituted the nuts for a puree of whole oranges (yes, whole oranges). I have never seen this done before. I’ve seen baklava with different nuts, different pastries (the usual filo or thread-like kadaifi) and different spices or flavours, but the nuts were always a feature. Could this fruity version work? It would surely be a vibrant-tasting treat, so I thought that it would be worth trying it. The recipe is taken from the Observer Food Monthly, available here (scroll down for the recipe). The filling basically involved cooking whole oranges, then preparing a sweet, spiced puree to fill the baklava. I cooked the oranges the night before, then left them to cool before preparing the puree the next day. This is a useful way to do it, as it means you can prepare the baklava the next morning relatively quickly. It all really was super-easy, but I found I had to cook the sugar syrup for about 20 minutes rather than the suggested 10. I also added half a teaspoon of rose water to the syrup as I like the baklava to be really fragrant. You could avoid the “specks” on the cooked baklava by clarifying the butter you use for the filo, but I don’t bother. Just hide them using the chopped pistachio nuts! Worth making? Wow, did this taste of orange. Not a subtle flavour, but a real citrus-fest in the mouth. I really liked it and it was a lot lighter and fresher than nut baklavas, but it is such a strong taste that I would be inclined to serve it in larger pieces with mascarpone or creme fraiche as a dessert proper, rather than as a post-dinner accompaniment to coffee. 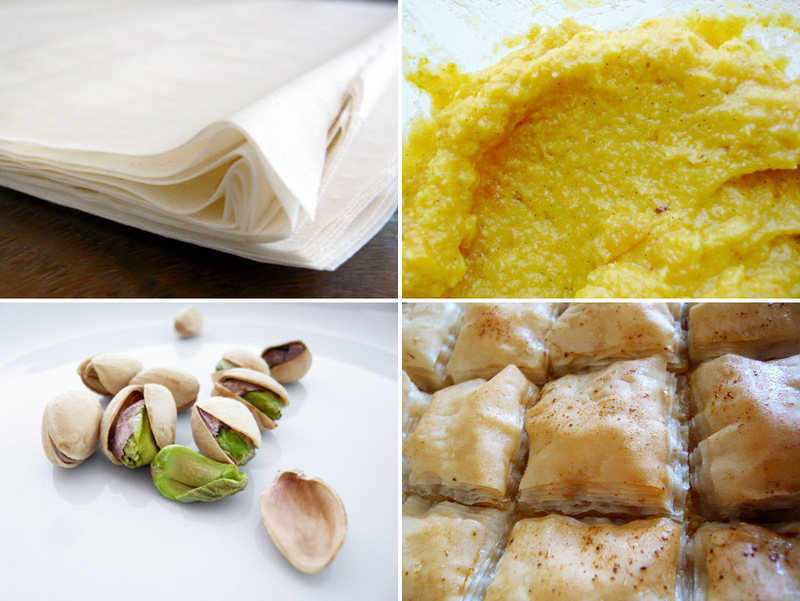 I also found that it is best served relatively fresh (really as soon as it has cooled), as the filling is moist and thus does not absorb the sugar syrup the way that a nut-filled baklava would do, meaning that the filo pastry becomes soft quite quickly.